Gregg Gregory, 82, of Overland Park, KS passed away the 12th of June, 2018 at home. He was born in Thessaloniki, Greece and immigrated to the United States in 1956. Born one of 10 children, family and faith were the center of his life. He was a proud Greek to the end and will be remembered for his cooking, humor and gentle nature. With his warm heart and philanthropy, he touched many throughout his career, church and those unknown to him. Gregg was a communicant of St. Dionysios Greek Orthodox Church in Overland Park, KS where he served as past President of the Parish Council, festival chairman and food chairman for the Annual Greek Food Festival and member of the building committee. He was a member of AHEPA since 1956 and found great reward in the fellowship. He was waiter at The Kansas City Club and maître d’/waiter at Putsch’s 210 on the Plaza. With business partner Jim Maras, Gregg co-owned and operated the Amoco/Standard Service Station on Johnson Drive for 30 years. Gregg is preceded in death by Helen his cherished wife of 45 years, parents Petros and Elpiniki Gligorievitz, beloved siblings Kosta (Gus) Gregory, Verra Gligorievitz, Militza Kaiafas, Michael Gregory, Orson Gregory and Mike Gregory, nephew Konstantinos (Gus) Gregory, niece Kelly Aguire and family pets Shasi, Tashi and Myko. He will be dearly missed by his children Christine and Michael Gregory (and Jerrod Sumner), grandpups Philomena and Phoenix, siblings Vicki Aguire, Freda Harrington, Thomas Gregory and many nieces and nephews. 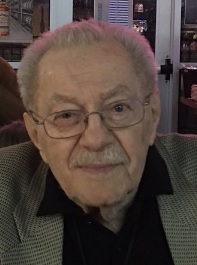 Services will be held at St. Dionysios Greek Orthodox Church, 8100 West 95th Street—visitation on Thursday, June 14 from 6 to 8 p.m., with the Trisagion and words of remembrance at 7:45 p.m., and funeral service on Friday, June 15, at 10 a.m., followed by a graveside service at Johnson County Memorial Gardens. In lieu of flowers, memorials are welcome to the Memorial Fund of St. Dionysios Greek Orthodox Church. May his memory be eternal. Services: 10AM, Friday, June 15, 2018 at St. Dionysios Greek Orthodox Church, 8100 W. 95th St.